I have started this thread to answer any questions that anyone might have about how to work with this forum. In the future feel free to post anything about why forum does it this way, or how do you do this etc. I know nobody asked this question so I decided I would ask the first question and I might try to answer it as well. In future I may do this several times. Question.. How do you change the avatar? 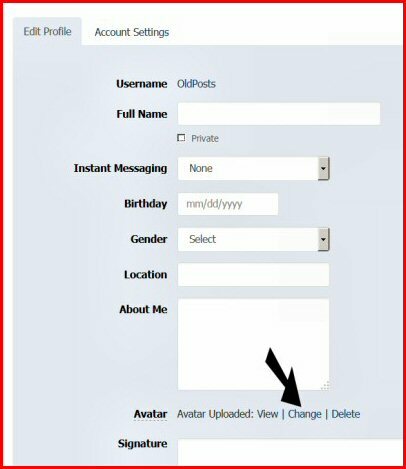 In the upper right-hand corner of the forum click just to the right of the present avatar and then click on edit profile. When you click on edit profile another screen will pop open. 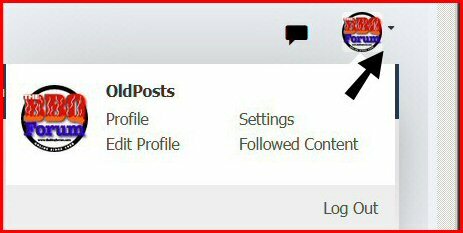 At this point you can make a lot of changes and add information to your profile that strictly up to you. If you don't want to sharing this information with other people in the forum then don't put it in. We're here just to change the avatar picture at this point. So, click to the link that says change. Then search through your hard drive and find the picture that you want to be used for your avatar. Then click on the picture and insert it. When you've done with that to see if it's what you wanted click on the view link next to the change link. If everything looks okay to you save it and your avatar's been changed. Feel free to do this as often as you want the please set up an avatar as a help make the form look good. That's all for now. What is the size of the Avatar allowed? Does it automatically crop or resize an image? All images appear to be resized automatically. However, that being said every large picture takes up a lot of disk space so if you do have the ability to resize their avatar picture then please do it. After all an avatar is a very small picture. Question – Why is it when I'm logged on and I click on a topic it takes all the way to the bottom of the list. So then I have to scroll all the way to the top to start reading the posts. Answer – I don't know but it's been fixed. Now when you click on a topic and you are logged in or not it takes you to the top. Then you can scroll down through the messages and if you want to post something you can do it when you get to the bottom. 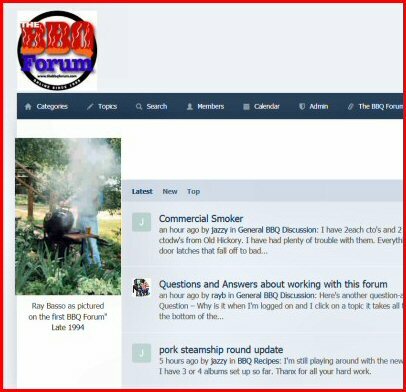 Question - Does the forum look any different with different web browsers? Answer - Yes with the Firefox web browser you can see a picture that will change from time to time. You can only see this image with Firefox and some other browsers on some of the older Windows platforms. 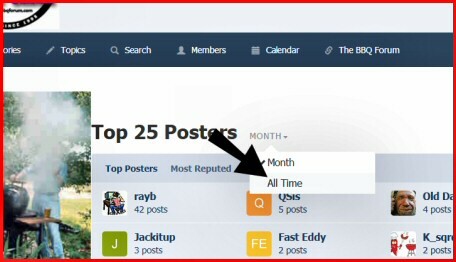 note: some things also look a bit different for those that are signed into the forumand people who are not logged on.. Question - When posting a message how do you insert pictures and other annotations? Answer it's very easy. When it comes to inserting pictures have to do a little preparation first. You have to have the picture stored on your hard drive somewhere and you need to know where it is. When you're putting together your post and you come to the point where you want your picture, click on the camera image as illustrated in the picture below. When you click on the camera image another window will open up you'll see of big button that says browse. Click on that button and then browse to the location of the picture you want. Next, click on the picture and click ok and bingo your pictures in the message as easy as that. 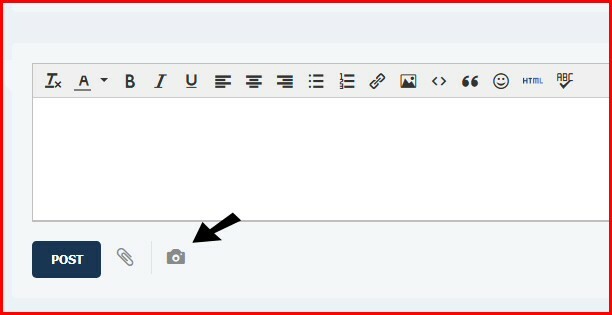 You can also use the menu across the top of this box to add other things to your post as you're typing it. For example, the picture image inserts a picture, the smiley face lets you put in a an emoji and the item that leans to the right allows you to put in a hyperlink. Question - How do you reply to a reply??? Suppose your reading a thread and as your going through the replies you come upon a reply that you want to make a comment directly to. This is really an easy thing to do, just move your mouse over the right side of the post and you will see a "reply with quote" box open up. 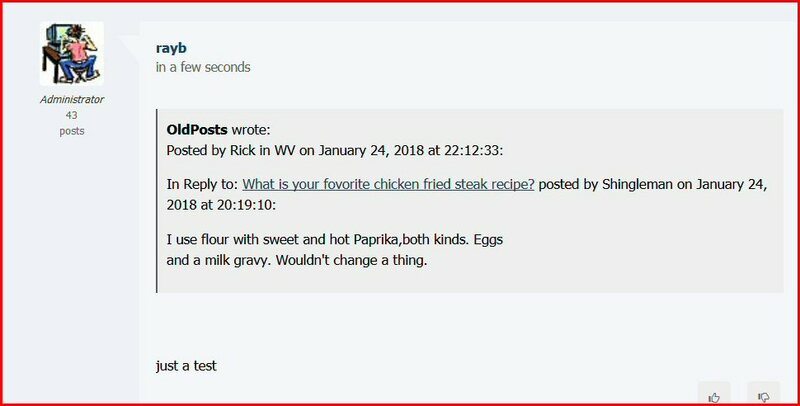 Then type your new comment in just below the automatically inserted quote. In this example my my comment consisted of "just a test"
When you're finished just click the post button. 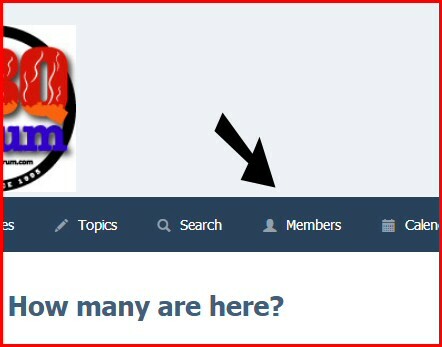 Question - How many registered people do we have on this forum updated all the time? To view a complete list of "how many are here." Question - What is this stuff over on the right side of the threads, on the main page? 1. This tells you how many replies of been made to the original thread at this point. 2. The thumb up or thumbs down tells you how many likes or dislikes this thread is received. 3. This number indicates how many page views this thread has received. Repeat viewing of this thread does not increase this number or visits from search engines ETC. Note: When you're actually viewing the topic, the stuff on the right side changes. This is where you get to choose whether you're going to give a like or dislike to this topic or reply. When giving a like or dislike you need to click on it with your mouse until it changes color or you're like or dislike will not count. Question - How can I share a link to a topic to somewhere else like Facebook or Twitter or just send it in an email? Move your mouse around over on the right side of the topic and look for this little down arrow to appear then click on it. When you click on it a box will open the says share the link and click on that. In a new window will open entitled share this post and there will be a very long URL underneath it. If you want you can just then click on one of the icons below and send that link to Facebook tweeter, etc. Another option would be to just highlight that very long URL cut and pasted into whatever you want and send it to whoever you want to. So I was looking at a couple of profiles, and saw something to the effect that said this person has not put anything in an album yet. So can you explain what "Albums" are, and how their used? Is there an online tutorial for this software? Question - What are albums? You asked if there was an online tutorial for the software– the answer is no. That's why I'm building this one. You have to be logged on in order to use the album feature. 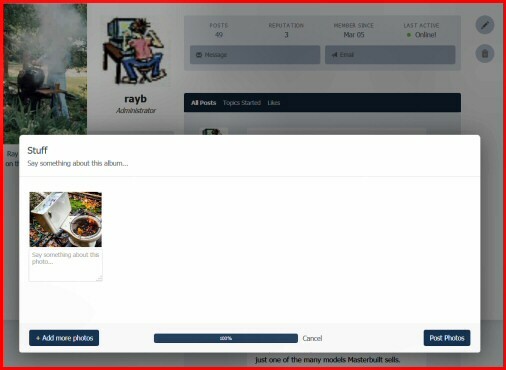 Then click on your avatar and when the small menu opens click on profile..
Once this windows open you can change the name of the album and the information underneath the albums name. Then you can add as many pictures this album as you want and save it. 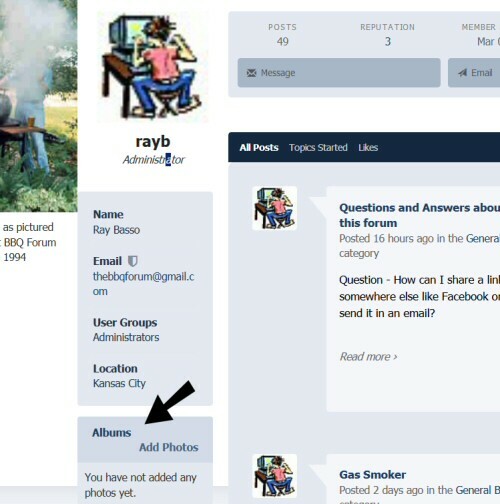 So for example you can load this up with several albums of BBQ pictures and then whenever you need one it will be easy to get to. Question - How do I create a poll on a new topic that I'm starting? It is not possible for guests (unregistered or not logged in users) to vote on polls. This is because there would be no way to uniquely identify the user to determine if they have already voted or not. If a user is not logged into an account, they can only be identified by their IP address and a user's IP address can frequently change. Therefore, to ensure the accuracy of votes on your polls, it is not possible for guest users to vote. I thought it would be a good idea to move this thread back up to the top of the forum. It has a lot of information about how to use features that are here. If you have any questions please ask him now try my best to answer them. Do you have to have a farcebook account to like or dislike something?